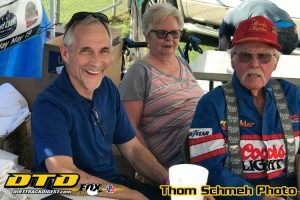 This past week I took Amtrak from Syracuse, New York, to Sacramento, California, to meet up with friends Kerry and Sheila Ross Fasig and head to the May 18-19 Peter Murphy Classic at the Thunderbowl Raceway in Tulare, Calif.
Kerry Fasig wrenches for the Mike Phulps-owned No. 56 Sprint Car team, which variously fields non-winged and winged 360- and 410-cubic-inch sprint car entries on both pavement and dirt. Tony Hunt and Ryan Bernal have driven for the Phulps team in the past, amongst others, with a good deal of success. Kerry’s wife Sheila is the daughter of the late Walter T. Ross, a driver turned owner turned Northern Auto Racing Club (NARC) president back in the day. Peter Murphy is a Sprint Car driver who achieved a good deal of success in the United States, New Zealand and his native Australia. He suffered a career-ending injury in 2013 and has settled in America with his family. This event has been held annually since 2014 in his honor and he works tirelessly to make it successful for the fans, teams, sanctions, Thunderbowl promoter Steve Faria, and the NARC Benevolent Fund. 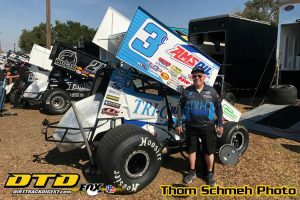 On Friday, May 18, the second-year Sprint Car Challenge Tour (SCCT) for 52 winged 360-cubic-inch ground-pounders took center stage, with the United States Auto Club (USAC) West Coast Sprint Car Series for 16 non-winged 360 c.i. machines providing the undercard. I had the honor of presenting SCCT and Placerville Speedway promoter Scott Russell with his 2017 North American 360 Sprint Car Poll’s “Promoter of the Year” award with Aussie announcer Stu McCarthy. With the help of friend Dave McMullen, I founded the National Sprint Car Poll post-season awards program in 1985, and it was incorporated into the National Sprint Car Museum’s awards programs in ‘89. “Hollywood” Danny Faria, Jr., won the 30-lap, $1,500-to-win USAC feature (after popping his right-rear tire at the finish) over runner-up Colby Copeland, Ryan Bernal, Austin Liggett and Richard Vander Weerd, respectively. 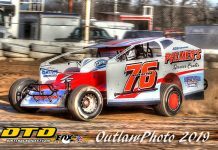 Others of interest to me were Shannon McQueen in seventh, Cody Smothermon in eleventh in Steve “Biggie” Watt’s car, Jace Vander Weerd in fifteenth and veteran Troy Rutherford in sixteenth. 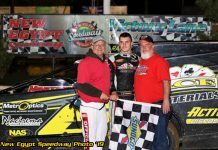 Giovanni Scelzi claimed his first 30-lap, $2,500-to-win SCCT main over runner-up Rick Hirst, Shane Golobic, Steven Tiner and Tanner Thorson, respectively. Others of interest to me were Brandon “Bud” Kaeding in sixth, versatile Colby Copeland in tenth, Tim Kaeding in eleventh, Willie Croft in thirteenth, Justin Sanders in the Mike Phulps #56 in fifteenth, Derrick James Netto in nineteenth, Aussie Matt Dumesny in 22nd, Andy Forsberg in 23rd, and Jason Solwold in 24th. Amongst the DNQ’s were Travis Coelho, Dominic Scelzi, Nathan Rolfe, Luca Romanazzi, Steven Kent, Cole Danell, and Jared Faria. 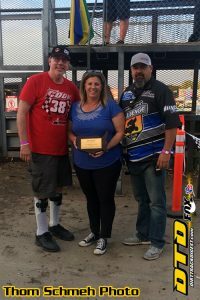 Sadly, the third-mile banked Central Valley dirt track, which annually hosts the prestigious Trophy Cup race, ‘took rubber’ early on the first night and both features were rather lackluster. 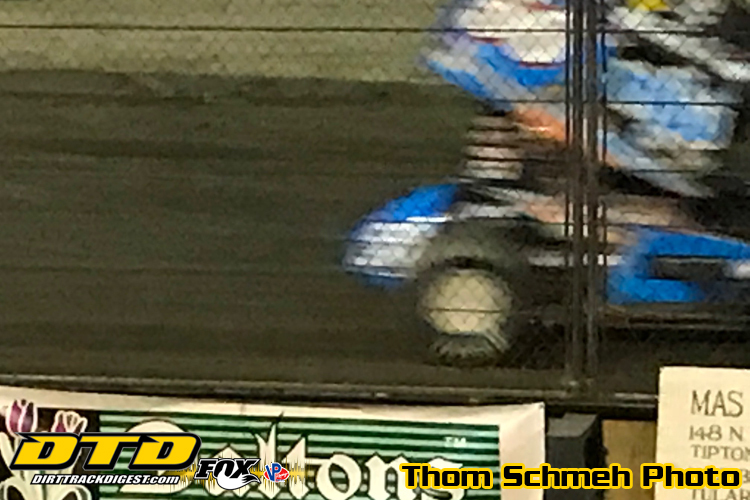 On Saturday, May 19, the headline division was the 34-car winged 410 c.i. King of the West Series (KWS)/NARC sprint car division, with the now-20-car non-winged USAC West Coast Sprint Car Series being the preliminary card. The ‘Legends of Kearney Bowl’ also provided vintage exhibitions each night. Richard Vander Weerd won the 30-lap, $4,000-to-win main event over runner-up Ryan Bernal, Tristan Guardino, Austin Liggett and Jace Vander Weerd, respectively. 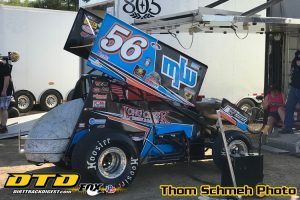 Others of note were Danny Faria, Jr., in seventh, Troy Rutherford in ninth, Shannon McQueen in tenth, Brody Roa in the Mike Phulps #56 (sans wing) in fourteenth, and Colby Copeland in fifteenth. This finish was delayed when an auto accident (with a utility pole) in Tulare caused a power outage at the track. Shane Golobic passed Kyle Hirst and “Bud” Kaeding on the final restart (caused by a controversial yellow flag on the final turn of the original final lap) to win $11,000 in the 30-lapper over Kaeding, Hirst, Willie Croft and Tim Kaeding. Others of interest to me were Jason Solwold in sixth, Gio Scelzi in seventh, D.J. 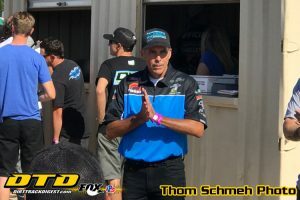 Netto in ninth, two-time World of Outlaws (WoO) champion Jason Meyers in tenth, Colby Copeland in eleventh, Tanner Thorson in Clyde Lamar’s #3c in twelfth, Dustin Golobic in fifteenth, Dominic Scelzi in nineteenth, Bobby McMahan in 21st, and Max and Melinda’s son Matt Dumesny in 22nd. Amongst the DNQ’s were Nathan Rolfe, Chelsea Blevins, Jenna Frazier, and Cole Danell. All in all, the quick train trip to Sacramento (and eventually Tulare) was very enjoyable, as I caught up with friends Kerry & Sheila Fasig, fun-raiser Peter Murphy, historian Lance Jennings, former National Sprint Car Museum board member Clyde Lamar, hand-controls guru Brad Doty, announcers Bobby Gerould and Stu McCarthy, photographer Janet Larson, writer Norm Bogan, Bonneville Salt Flats sprint car builder/record-holder Steve “Biggie” Watt, videographer Dean Mills, Aussie spanner Ashley Smith, ever-smiling Kris Flachman, and Louie Vermeil Classic at Calistoga promoters Jeanie & Tommy Hunt (of dad’s Joe Hunt Magnetos fame) amongst others. I also met 2015 Ocean Speedway champion Justin Sanders, two-time 2018 USAC West Coast Sprint Car Series winner Brody Roa, rice-grower Harley Van Dyke, 2016 Antioch Speedway “Rookie of the Year” Jenna Frazier, promoter Steve Russell and his wife Kami Arnold, and past Lincoln (Ill.) feature winner Willie Croft. I had hoped to catch up with announcer Gary Thomas and NARC publicist Jim Allen, but I never did. Any (and all) criticisms and notes are welcome at iowabasedtraveler@yahoo.com. Thanks!